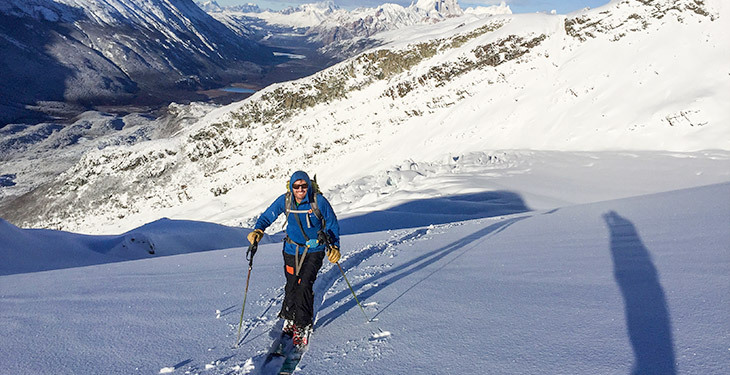 The backcountry ski adventure of a lifetime! 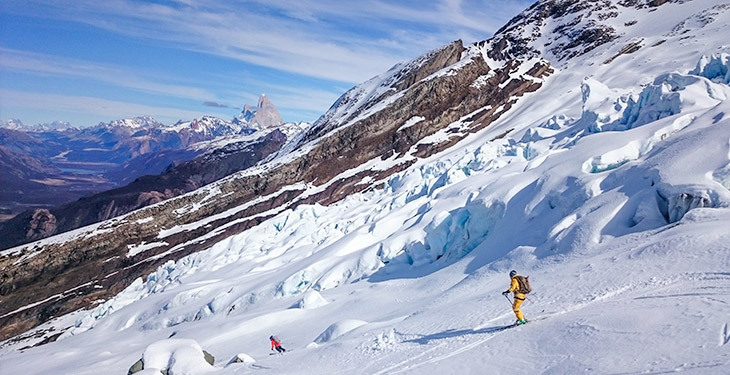 For fans and lovers of backcountry ski, the mountain village of El Chaltén offers the possibility to climb and ski moderate mountains with incredible surrounding views of Mount Fitz Roy, Cerro Torre, and the Southern Ice Field. Throughout your tour you'll have a variety of ski options: Loma del Diablo, Cerro Vespignani, and Cerro Madsen. These places are very remote and you'll rarely find any other people around. You'll cross frozen lakes and glaciers and enjoy sweeping views of the rugged and awe-inspiring Patagonian landscape. When you're not skiing, relax and enjoy the quaint village of El Chaltén. This trip is ideal for individuals with ski touring experience and excellent fitness, as you'll be hiking and carrying your own skis. 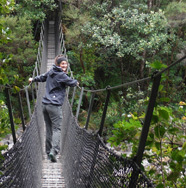 This tour is designed to do two or three day trips, plus a camping trip for one or two nights. This flexibility will allow you to adapt according to the snow and weather conditions. Enjoy this unique experience of a lifetime! Arrive at El Calafate Airport where you'll be greeted and taken to your hotel in El Chaltén. Once you're settled, you'll receive a briefing from your guide with all of the details of the program and a thorough equipment check. Wake early in the morning for a drive to “Mosquito” creek (12 miles away). From there you'll start the ascent through the lenga forest. In about one hour's time you'll reach the snow (usually above the tree line), and continue the ascent with your skis. There are different options on the ascent, and depending on the weather and snow conditions you can choose between climbing the main summit (5,900 ft) or the “Mosquito” summit. From either summit you'll have great views of Fitz Roy on a clear day! The vertical gain is just under 4,000 feet, but most times it's possible to do two or three descents of the upper section in one day. Afterwards, you'll return to your room in El Chaltén. Early this morning you'll drive from El Chaltén to Lago del Desierto, located 24 miles away. To reach Cerro Vespignani, you'll approach the base of the Huemul Glacier and continue the ascent using skis towards the summit (7,040 ft). It will take about 6 to 7 hours to get to the summit, but once you reach the top the views are worth it! Cerro Crestón may also be an option, depending on conditions. After a break, you’ll have a few options for the ski descent, which will take about two hours. Arrive back at the car and drive back to El Chaltén in the afternoon. Today most of the day will be spent on the approach to Fitz Roy Base Camp. 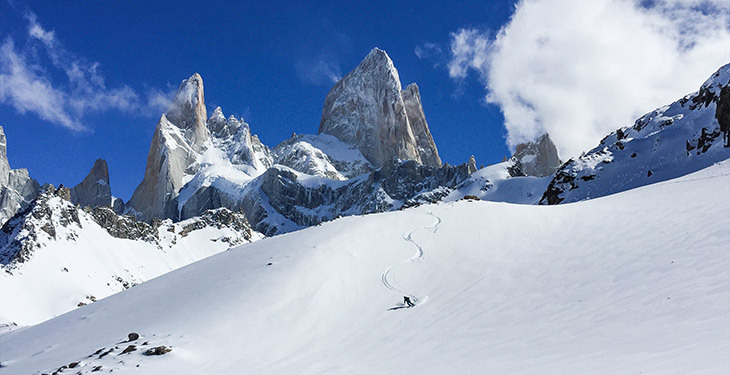 You'll settle in at Campo Base Poincenot at the base of Cerro Fitz Roy and, depending on the time and snow conditions, perhaps take an optional ski trip to Glacier de los Tres. Rise early in the morning and depart to the staging grounds at El Pilar. Once there, you'll head up the Río Blanco Valley, through the climbers camp, and start the steep ascent to Laguna de los Tres (approx. 3,937 ft). Then, you'll continue with the skis up the east face of Cerro Madsen another 1,900 feet higher. 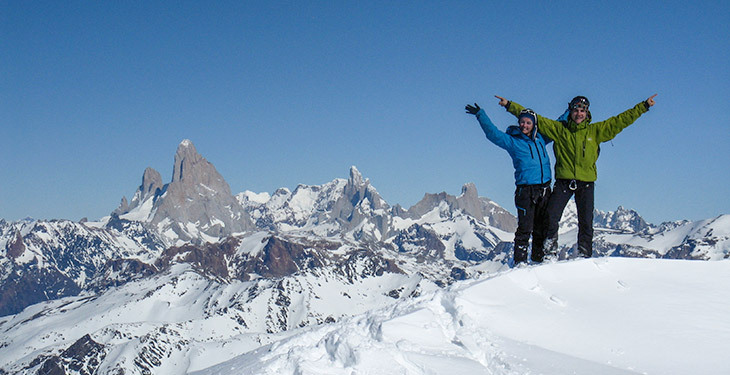 At the top, enjoy impressive views of Fitz Roy and Piedras Blancas Glacier. After a break and some photos, you'll ski down the descent, sometimes all the way back down to the camp, and then hike back to El Pilar and return to Poincenot. This morning you'll return to El Chaltén, and have the rest of the day free to explore or relax. Be sure to take some final pictures of the amazing scenery! Bid farewell to beautiful El Chaltén and transfer to El Calafate Airport for your flight back home. All itineraries are subject to change based on local conditions and the judgment of the guide. External factors such as snow conditions or weather could change the original plan, and your guide reserves the right to modify the itinerary if necessary. 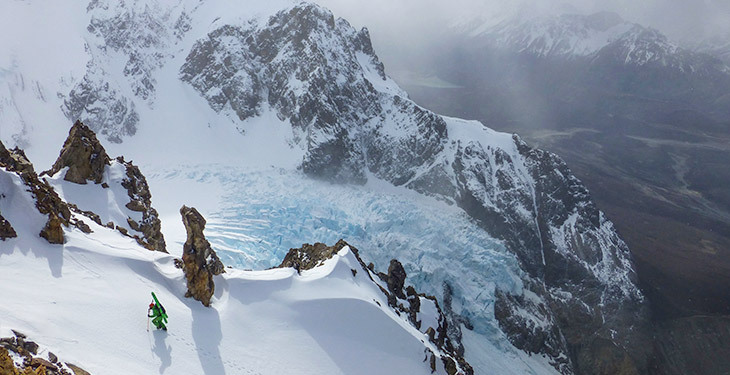 The guides at Mountaineering Patagonia love exploring the mountains and learning from them, and they invite you to come along for the journey. Mountaineering Patagonia was founded in 1995 in El Chaltén, Argentina, surrounded by the mystical Fitz Roy and Torre mountains. 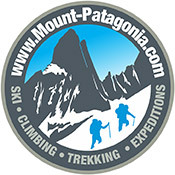 They have national AAGM and international UIAGM-IFMGA certifications, and specialize in Southern Patagonia expeditions. They offer climbing trips, mountaineering expeditions, Southern Ice Field expeditions, and backcountry ski trips, planning the logistics in an effort to make your adventures easier and more enjoyable. Owner and Head Guide, Merlin Lipshitz is a certified UIAGM-IFMGA Mountain Guide who has lived in El Chaltén since 1998. Originally from Bariloche, he has been leading trips and expeditions for more than 20 years and has done climbs and ascents in the many mountains of Patagonia, Peru, Bolivia, United States, and Europe (including three ascents on Fitz Roy, two on Cerro Torre, Alpamayo, El Capitán, Mont Blanc, and Aconcagua among others). He is also a ski instructor, is passionate about backcountry ski, and speaks fluent English, and intermediate Italian and French. Merlin was an awesome guide for my five days of skiing. He's been in Chaltén for 20 years, so he knows the landscape and the mountains well. He knows how to adapt the trip to the weather and the available resources to make sure you get the most out of your time and he is a consummate professional throughout. Would recommend him as a guide any time. My primary plug is for the area itself. I cannot stress enough how important it is to go to Chaltén and experience those valleys while they are still relatively untouched (except by serious climbers), before the rest of the world gets wind of them. 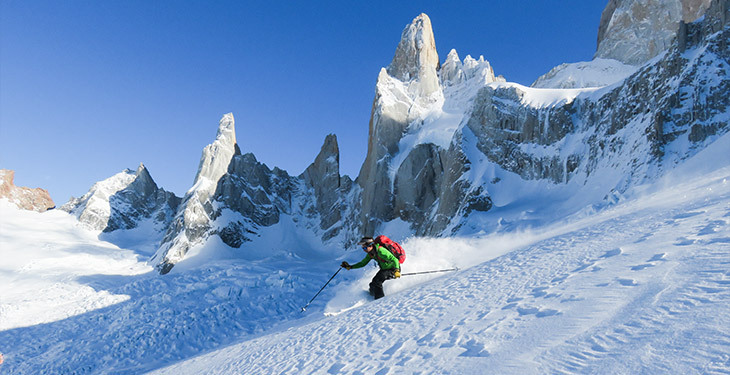 I spent five amazing days doing some ski touring in the Fitz Roy region!! To some extent, the landscape is comparable to Chamonix Mont Blanc but this is much much wilder!!! You can really feel the nature. There is no one else on the mountain... everything is just for you!! This is an incredible feeling which is not easy to have in Europe. On top of that, Merlin is a really good guide and a very nice guy. Everything was very well organized. I highly recommend this trip to all ski touring lovers. We had a BLAST skiing Cerro Vespignani with Merlin! He made a great call on going to Cerro Vespignani with the uncertain weather we had. While the winds were high during the start of the day, they settled down and allowed us to summit and ski the whole mountain. Despite the late season dates (November 12), Merlin was psyched to take us skiing. His knowledge of the area really paid off and turned this day into an unforgettable one! Our group had an amazing experience skiing Cerro Vespignani with Merlin. He has a wealth of local knowledge that provides for the best experience and for safety. Also, Merlin is a very personable guide and a lot of fun to be with in the mountains. I highly recommend paying him a visit at Mountaineering Patagonia. I look forward to having more guided adventures with them in future. Please note there is a minimum of two participants required per departure in order for the trip to run. Please wait to make travel arrangements until you receive confirmation from Mountaineering Patagonia. Are departures guaranteed? Are there any conditions that may prevent this trip from running? Please note there is a minimum of two participants required to run the trip. Other unforeseen events, such as extremely poor weather, may delay the trip. If there is not enough snow or other unforeseen conditions beyond Mountaineering Patagonia's control, the trip may be cancelled. Please wait for confirmation from Mountaineering Patagonia before booking your flights. Plan to fly to Buenos Aires and connect to El Calafate Airport (FTE). Please note you'll be responsible for booking your own international airfare to Argentina. In El Chaltén you'll be staying in double occupancy hotels or rented apartment rooms. On Days 4 and 5 you'll have a double occupancy tent at Poincenot. A single supplement option is available for $300 during your nights in El Chaltén. Private accommodations are not available for the two nights in camping tents. Each travel group will be from 2 to 4 guests, with at least one experienced guide. What type of shape do I need to be in? How much ski experience do I need? It's very important to have ski touring experience and have excellent physical fitness for this trip. Many times during this trip you'll be walking and carrying your own skis. Which meals are included? What is the food like? This trip includes two breakfasts, three packed lunches, and two dinners on Days 4 and 5 (camping days). Dinners in town are not included and pack lunches on all other days can be provided for an additional fee. Plan to bring about $300-$400 for meals that are not included, items not included in the trip cost, souvenirs, gratuities, and other personal expenses. *Note: If you need to rent any climbing equipment, please let Mountaineering Patagonia know in advance. Travel insurance and rescue insurance is required for this adventure. It allows you to seek reimbursement if you are forced to cancel your trip for unforeseeable reasons, or if you need to cover medical help, emergency transport, and/or theft or accidental damage while traveling. For travel insurance, we recommend World Nomads as a provider.